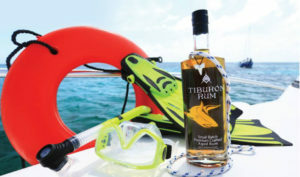 While scuba diving throughout the Caribbean, our search began for the perfect rum. We found it in an amazing place — Belize, where they still make small batches of handcrafted rum, and where the warm breezes help the rum gently reach maturity. Today we bring you Tiburon Rum, a special rum which has been aged and blended from a variety of barrels of varying age and character. Only the finest local ingredients are used to achieve the highest quality rum, which is re-casked by Master Blenders into Kentucky Oak Bourbon Barrels for the “second maturation” to allow the natural tannins to give the rum a rich golden color, smooth finish, and subtle hints of vanilla and oak. An alluring spirit as exotic as Belize itself, Tiburon Rum has a taste profile that is perfect for sipping or mixing. Enjoy this special Belizean rum with family and friends.